Arthur Henry b.1873 – d.1948. Married Eva Florence Brown in Blandford on 8th May 1904. Florence (christened Flora Emily on 25/11/1874) b.1874 – d.1929. Married Walter Davis in Blandford on 7th May 1897. This is recorded on Walter’s British Army Pension Records. He enlisted in August 1916, aged 55 years, into the Royal Defence Corps. On the 1911 census they are living at School Lane, Blandford. George Jesse (christened 06/05/1885) b.1885 – d.1890. Edward Sydney (christened 30/08/1889) b.1889 – d.1891. Madeline Norah Brenda (christened 11/09/1891) b.1891 – d.1892. Lily (christened Ina Lilian Brenda 18/04/1894) b. 04/02/1894 – d.1983. Married Jack Neville in Southampton in 1914. In the 1891 census Victor is living with his parents and his brother Arthur (b.1874) in East Street Lane, Blandford, Dorset. Arthur is working as a general labourer and Victor’s father gave his occupation as a Wheelwright. By the 1901 census Victor is living at 7 Nightingale Court, Cook Street, St Mary’s, Southampton with his parents and his sister Lily. Dorothy M (b.1913 – d.1938). Married Harry Hart in Southampton in 1920. Louisa Winifred (b.1914 – d.1999). Married Fred J Cooper in Southampton in 1936. He died on 27th April 1940. The 1911 census shows Victor is at Gibralter Barracks, Stanhope Lines, Aldershot with the 5th Field Company of the Royal Engineers. His rank at this time was Lance Corporal and his occupation was given as a joiner. ‘He enlisted Feb 1911 & sent to the Western Front in May 1915. He took part in several engagements & was severely wounded at the Battle of Loos. 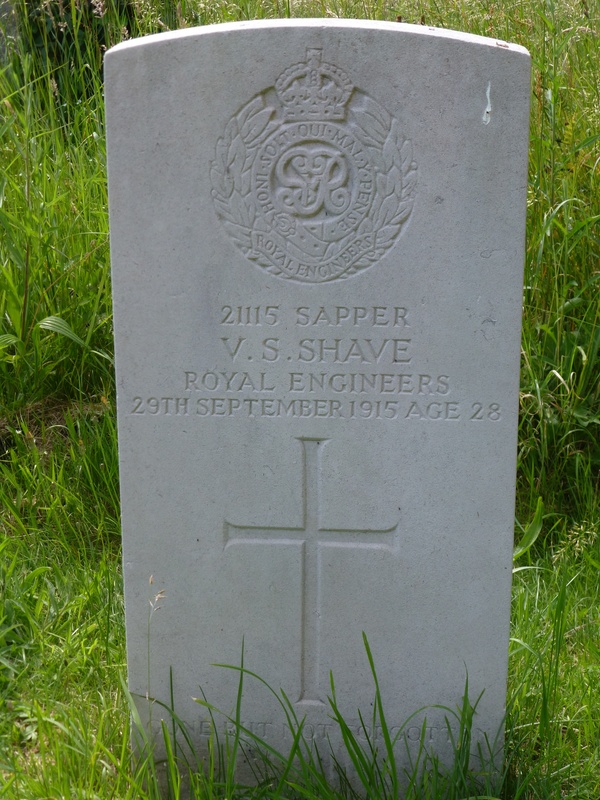 He was at once invalided to England, but died at Sheffield on September 29th 1915. He was entitled to the 1914-15 Star & the General Service & Victory medals. Victor probably died at Wharnecliffe Hospital, Sheffield. This hospital, which was previously the South Yorkshire Asylum, was offered to the War Office to be converted to a War Hospital and was handed over on 1st April 1915.